Let’s be honest: if we could, most of us would eat out every…single…night. Alas, our belts (and wallets!) stop us. Restaurant dishes are notorious for being high in calories, fat, sugar, and sodium. If you’ve ever looked at the nutritional information for your favorite restaurants online (and you should!) it can be pretty shocking. What leads us to favor eating out…convenience. Over time. we trade healthy living for this convenience. Many people eventually pay the price in the form of weight gain and illness. People fear that losing weight means giving up restaurant food altogether, but that needn’t be the case. In fact, knowing how to healthfully dine out is an asset. 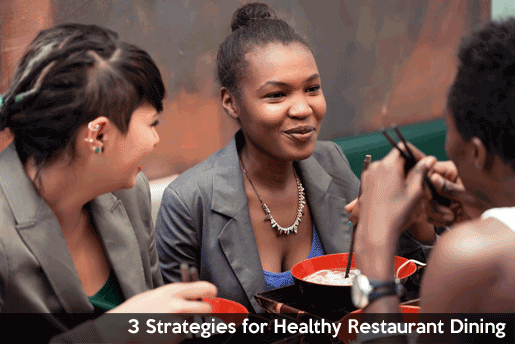 In order to move forward in your weight loss journey, you need to know how to be successful in any food situation- and that includes at a restaurant. You aren’t going to stop eating out with friends, family and loved ones- you just need a strategy. Naturally, the easiest way to slash calories is to eat half of your meal and save half for later- that much we all know or have heard. However, there are a number of other opportunities for you to reduce the number of calories in your meal before and after it hits the table. That way, the effects won’t hit you later on the bathroom scale. Don’t forget about hidden fat! The majority of excess calories in any one dish can typically be attributed to calories that are added in during the cooking process. For example, a mere 1 tbsp of olive oil contains 120 Calories! Because these calories are virtually invisible (we don’t see them on our plates, yet they’re certainly there! ), and because they don’t fill us up the way high fiber foods do, they can become a big problem over time. Hidden fats added during the cooking process are wide-ranging and largely dependent on the type of dish, so it’s smart to order items that are typically prepared with very little added calories- raw items like Sashimi, for example, have no opportunity for fat to be added. When ordering a bread-based item, be sure to ask for your bread or bun “dry”- otherwise, it will likely come toasted on the grill, which adds 50-100 Calories, depending on the grill and seasoning process. Most restaurants apply margarine or butter to buns before placing them on the grill, and that’s before any added sauces or condiments! Note: Added sugar and sweeteners can also be an issue, especially when it comes to beverages, alcohol and sauces. If you’ve never heard the term, a “health halo” is a positive association we have with a food because we believe it to be healthy, even when its preparation makes it less than virtuous. Many restaurant dishes fall into this trap: we know that sweet potatoes are healthy, so surely sweet potato fries must be healthier or lower in calories than regular french fries, right? In reality, the two are nearly identical caloric-ally and nutritionally in many cases. Restaurant salads are perhaps the most dire example of a health halo: salads often contain as many (or more!) calories as a burger or a steak, but we simply believe them to be healthier. Chefs can pack a lot of Calories into a seemingly healthy dish, through the addition of high-Calorie “extras” like candied nuts, sugared dried fruits, cheese, dressing, and oil. Always order dressing on the side, and remember that every “portion cup” of dressing contains 2 oz on average and 240-400 calories, depending on the type of dressing. Bottomline: Know what you are actually eating: what’s in it and how it was prepared. Don’t be shy to ask for something prepared differently. Polite requests are typically well-received by restaurants. The goal of any venue is customer satisfaction. Leaving sauces on the side or requesting that a kitchen holds a side dish or topping is an easy fix. You can also customize certain items even after you’ve ordered them. Simply removing the top of a burger bun or eating a sandwich “open-faced” can save about 100 calories. Similarly, removing cheese or croutons from a salad could nix another 100+ calories. Aside from simply consuming less of any given dish, customization is the most potent means of reducing the calories in restaurant dishes. The more you know ahead of your restaurant visit, the better. Go online and check out nutrition information. Don’t be afraid to ask questions about how your food will be prepared. The more informed you are, the better decisions you can make.